The light of quality and civilization shines the world! Belt conveyor is the essential and economical transferring set in the uninterrupted production line. In terms of transferring capacity, belt conveyor can be classified into two types, the heavy type such as for mining convey and the light type for plastic, food and chemical industry, etc. Belt conveyor features with strong transferring capacity, easy maintenance and long conveying distance.ZENITHis a professional belt conveyor manufacturer, according to different material, we design different belt conveyor. Our belt conveyor is your beat choice. 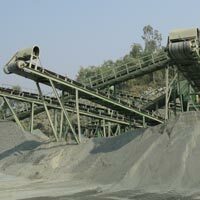 Belt Conveyor is widely used in the fields such as mining, metallurgical and coal industry to transfer sandy or lump materials. Single set or unit of multi-sets of belt conveyor can be chosen to meet virus production lines. The conveyers which are produced by ZENITHconsist of standard parts, which are advanced and simple in structure, easy to maintain. They are widely used in mining, metallurgical and coal industry to transfer sandy or lump material, or packaged material. According to different transferring equipment, the transfer system can be one independently or multi-conveyers or combined with other transfer equipments. The belt conveyer can be installed horizontally or aslope to meet the needs of different transfer lines. The belt conveyers produced by ZENITHcan be operated in the circumstance temperature range from -20�� to +40��. The temperature of transferred material by this belt conveyer should be lower than 50��. 1. stable and longer convey with no relative movement. 3. simple structure, easy maintenance, energy-saving and low cost.